This book is free on these days only – 06/13/2013 at midnight PST until 11:59 pm on 06/13/2013. If the dates are the same that means the book is free one day only. 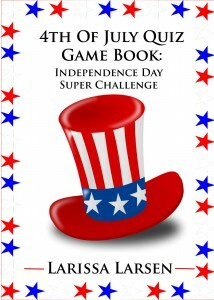 4th Of July Quiz Game Book: Independence Day Super Challenge is a fun and educational way to celebrate our nation’s beginnings. If you are looking to discover a great way to pass the holiday time or just a fun filled summer family activity, this short quizette book will keep players engaged and informed.